MIL-STD-461 is a military standard that establishes electromagnetic interference (EMI) limits and test procedures for military equipment. EMI consists of any undesired signals, “noise”, generated by electronic equipment. Keeping EMI under control is critical for military applications. It can cause interference with other equipment and be detected by the enemy. The standard addresses emissions generated by equipment as well as the susceptibility of equipment to degraded operation in the presence of external emissions. Tests procedures and limits are defined for EMI transferred via conducted and radiated means. The limits vary depending on the application (e.g. ground, air, ship, etc) as well as the location of the equipment (e.g. above deck, below deck, flight-line, etc). While the standard suggest these limits, it advises that the levels be adjusted to ensure the best integration of all the equipment. Two tables in MIL-STD-461F that are used to decide what limits your equipment needs to meet is Table IV and V (shown below). The sections below are definitions of the various requirements based on MIL-STD-461 version F.
CE101 and CE102 cover the conducted emissions related to the power leads including returns that are connected to a power source outside of the system being tested. These test procedures are used to verify that electromagnetic emissions from the equipment under test (EUT) do not exceed the specified requirements for power input leads including returns. 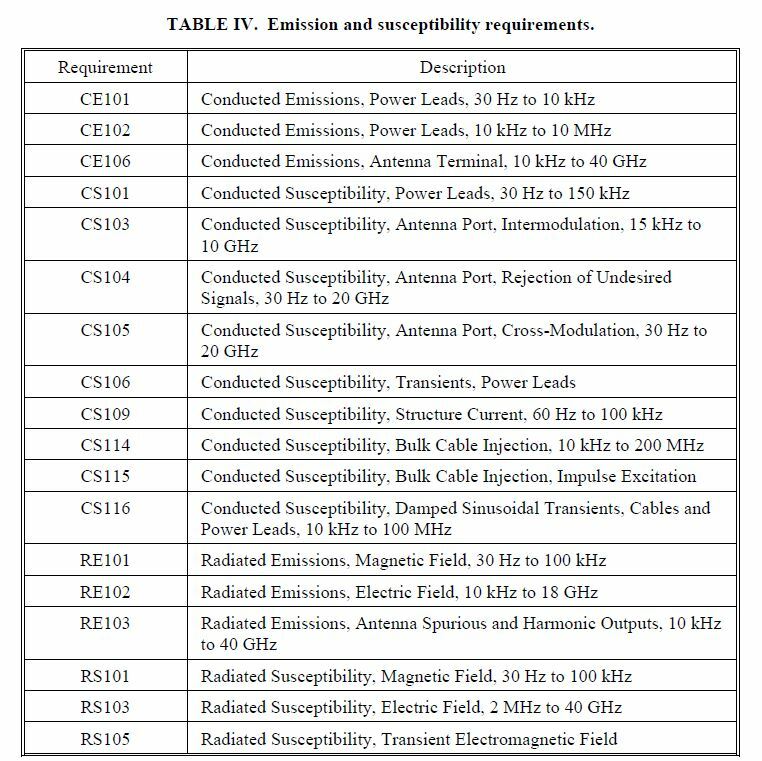 CE106 is conducted emissions related to the antennae terminal of transmitters, receivers, and amplifiers. The equipment under test should not exceed the specified limits. This test procedure is used to verify that conducted emissions appearing at the antenna terminal of the EUT do not exceed specified requirements. CS101 is applicable to equipment and subsystem AC (limited to current draws ≤ 100 amperes per phase) and DC input power leads not including returns. The equipment under test (EUT) should not malfunction, degrade in performance, or deviation from specified indications, beyond the tolerances indicated in the individual equipment or subsystem specification, when subjected to a test levels. This test procedure is used to verify the ability of the EUT to withstand signals coupled onto input power leads. CS103 and CS104 are for the receiver front-end susceptibility requirement applicable to equipment and subsystems, such as communications receivers, RF amplifiers, transceivers, radar receivers, acoustic receivers, and electronic warfare receivers as specified in the individual procurement specification. CS103 is conducted susceptibility for antenna port, intermodulation, 15 kHz to 10 GHz. The EUT shall not exhibit any intermodulation products beyond specified tolerances when subjected to the limit requirement provided in the individual procurement specification. This test procedure is used to determine the presence of intermodulation products that may be caused by undesired signals at the EUT antenna input terminals. CS104 is conducted susceptibility for antenna port, rejection of undesired signals, 30 Hz to 20 GHz. The EUT shall not exhibit any undesired response beyond specified tolerances when subjected to the limit requirement provided in the individual procurement specification. This test procedure is used to determine the presence of spurious responses that may be caused by undesired signals at the EUT antenna input terminals. CS105 is the receiver front-end susceptibility requirement is applicable only to receivers that normally process amplitude-modulated RF signals, as specified in the individual procurement specification. The EUT shall not exhibit any undesired response, due to cross modulation, beyond specified tolerances when subjected to the limit requirement provided in the individual procurement specification. This test procedure is used to determine the presence of cross-modulation products that may be caused by undesired signals at the EUT antenna terminals. CS106 is the requirement applicable to submarine and surface ship equipment and subsystem AC and DC input power leads, not including grounds and neutrals. The EUT shall not exhibit any malfunction, degradation of performance, or deviation from specified indications, beyond the tolerances indicated in the individual equipment or subsystem specification, when subjected to a test signal with specified voltage levels. This test procedure is used to verify the ability of the EUT to withstand transients coupled onto input power leads. 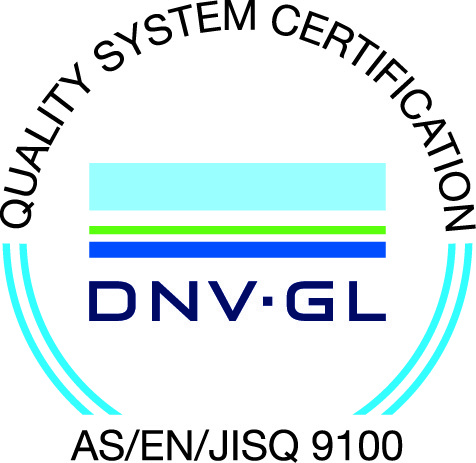 CS109 is for equipment and subsystems that have an operating frequency of 100 kHz or less and an operating sensitivity of 1 μV or better (such as 0.5 μV). Handheld equipment is exempt from this requirement. The EUT shall not exhibit any malfunction, degradation of performance, or deviation from specified indications, beyond the tolerances indicated in the individual equipment or subsystem specification, when subjected to the specified values. This test procedure is used to verify the ability of the EUT to withstand structure currents. CS114 is applicable to all interconnecting cables, including power cables. The EUT shall not exhibit any malfunction, degradation of performance, or deviation from specified indications beyond the tolerances indicated in the individual equipment or subsystem specification, when subjected to an injection probe drive level which has been pre-calibrated to the appropriate current limit. The requirement is not applicable for coaxial cables to antenna ports of antenna-connected receivers except for surface ships and submarines. This test procedure is used to verify the ability of the EUT to withstand RF signals coupled onto EUT associated cabling. CS115 is applicable to all aircraft, space, and ground system interconnecting cables, including power cables. The requirement is also applicable for surface ship and submarine subsystems and equipment when specified by the procuring activity. The EUT shall not exhibit any malfunction, degradation of performance, or deviation from specified indications, beyond the tolerances indicated in the individual equipment or subsystems specification, when subjected to a pre-calibrated signal having rise and fall times, pulse width, and amplitude as specified in the requirement. This test procedure is used to verify the ability of the EUT to withstand impulse signals coupled onto EUT associated cabling. CS116 is applicable to all interconnecting cables, including power cables, and individual high side power leads. Power returns and neutrals need not be tested individually. For submarine applications, this requirement is applicable only to cables and leads that exit the pressure hull. The EUT shall not exhibit any malfunction, degradation of performance, or deviation from specified indications, beyond the tolerances indicated in the individual equipment or subsystem specification, when subjected to a signal having the waveform and maximum current as specified in the requirement. This test procedure is used to verify the ability of the EUT to withstand damped sinusoidal transients coupled onto EUT associated cables and power leads. RE101 is applicable for radiated emissions from equipment and subsystem enclosures, including electrical cable interfaces. The requirement does not apply to radiation from antennas. For Navy aircraft, this requirement is applicable only for aircraft with an anti-submarine warfare (ASW) capability. This test procedure is used to verify that the magnetic field emissions from the EUT and its associated electrical interfaces do not exceed specified requirements. RE102 is applicable for radiated emissions from equipment and subsystem enclosures, all interconnecting cables, and antennas designed to be permanently mounted to EUTs (receivers and transmitters in standby mode). The requirement does not apply at the transmitter fundamental frequencies and the necessary occupied bandwidth of the signal. The requirement is applicable at different frequency ranges for ground, surface ships, submarines, aircraft, and space. This test procedure is used to verify that electric field emissions from the EUT and its associated cabling do not exceed specified requirements. RE103 may be used as an alternative for CE106 when testing transmitters with their intended antennas. This requirement is met if the emissions do not exceed the applicable RE102 limit. CE106 is the preferred requirement unless the equipment or subsystem design characteristics preclude its use. This test procedure is used to verify that radiated spurious and harmonic emissions from transmitters do not exceed the specified requirements. RS101 is applicable to equipment and subsystem enclosures, including electrical cable interfaces. The requirement is not applicable for electromagnetic coupling via antennas. 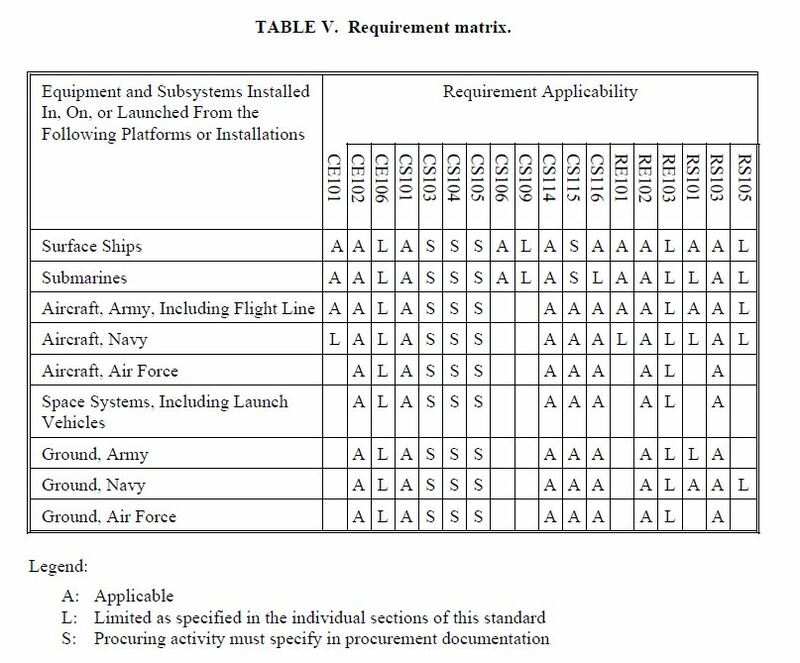 For equipment intended to be installed on Navy aircraft, the requirement is applicable only to aircraft with ASW capability. For Army ground equipment, the requirement is applicable only to vehicles having a minesweeping or mine detection capability. For submarines, this requirement is applicable only to equipment and subsystems that have an operating frequency of 100 kHz or less and an operating sensitivity of 1 μV or better (such as 0.5 μV). The EUT shall not exhibit any malfunction, degradation of performance, or deviation from specified indications, beyond the tolerances indicated in the individual equipment or subsystem specification, when subjected to the magnetic fields shown in the requirement. This test procedure is used to verify the ability of the EUT to withstand radiated magnetic fields. RS103 is applicable to equipment and subsystem enclosures and all interconnecting cables. The requirement is applicable at different frequencies depending on the application. The EUT shall not exhibit any malfunction, degradation of performance, or deviation from specified indications, beyond the tolerances indicated in the individual equipment or subsystem specification, when subjected to the radiated electric fields in the requirement. This test procedure is used to verify the ability of the EUT and associated cabling to withstand electric fields. RS105 is applicable to equipment and subsystem enclosures when the equipment or subsystem is to be located external to a hardened (shielded) platform or facility. The requirement is applicable for equipment intended solely for use on non-metallic platforms when specified by the procuring activity. The requirement is applicable to Army aircraft for safety critical equipment and subsystems located in an external installation. The EUT shall not exhibit any malfunction, degradation of performance, or deviation from specified indications, beyond the tolerances indicated in the individual equipment or subsystem specification, when subjected to a test signal having the waveform and amplitude shown in the requirement. This test procedure is used to verify the ability of the EUT enclosure to withstand a transient electromagnetic field. MIL-STD-461 Table V shown above identifies the requirements that apply for various military systems and provides a good starting point for power supply EMI requirements. Over the years, ACT has designed and manufactured power supplies that meet the evolving MIL-STD-461 requirements. Contact ACT today to see how we can help you meet your specifications.